This is the time of year when our favorite daffodils, tulips and alliums are looking sad and spent. The flowers have dried up and the foliage is floppy. Here are a few Dos and Don’ts to follow, ensuring a bounty of blooms next spring. DON’T cut foliage before it is yellow and dying. Green leaves are still sending food down to the bulb. The stored sugars keep the bulb healthy through the winter and provide energy for the burst of flowering in the spring. Leave them uncut until they are truly yellowed and no longer photosynthesizing. 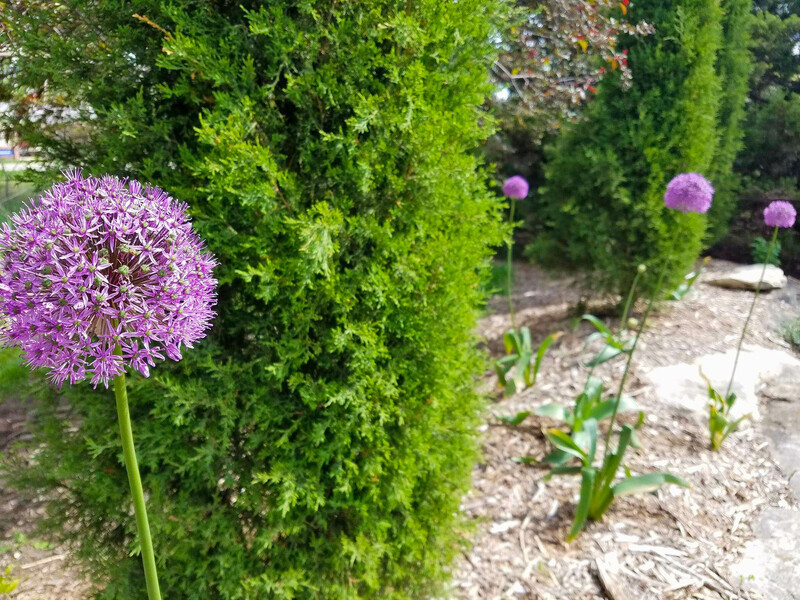 Giant allium in “Our Mother’s Garden”, blooming in early May. DO mark where your bulbs are planted. After the leaves are cut away and the summer perennials encroach, it can be difficult to remember where exactly your bulbs are. Mark the area with flags, wooden stakes, decorative stones, or golf tees to be sure you don’t accidentally dig them up. 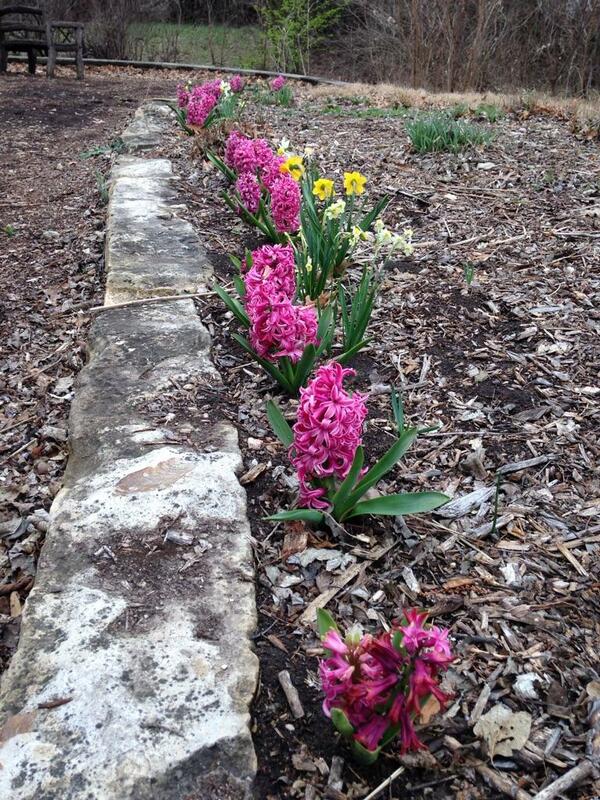 Pink hyacinth and daffodils, blooming in mid-March. DO fertilize. 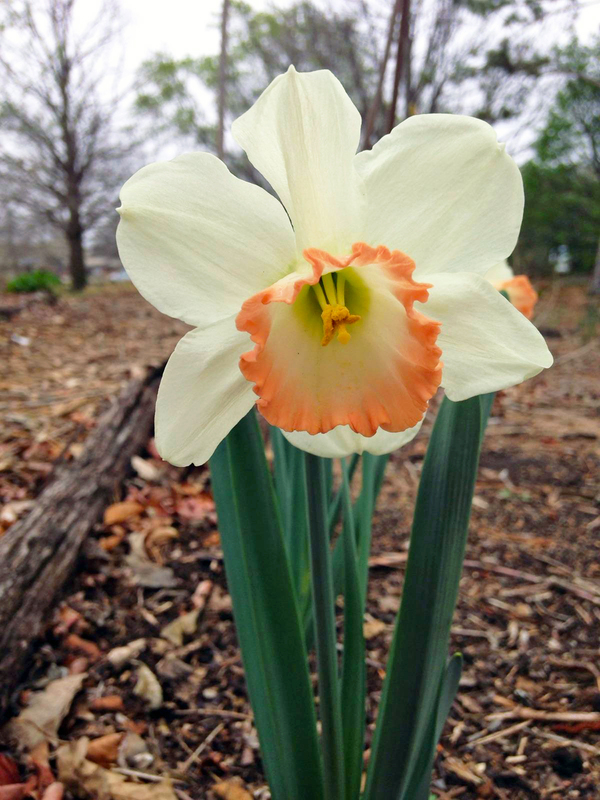 Bulbs benefit from a good boost when they are first planted, when they first break the surface of the ground in spring and then lastly in fall. Choose a fertilizer high in phosphorus and be sure to mix it with water or water it into the soil. Bulbs can only absorb nutrient that is carried in water, so moisture is a must. 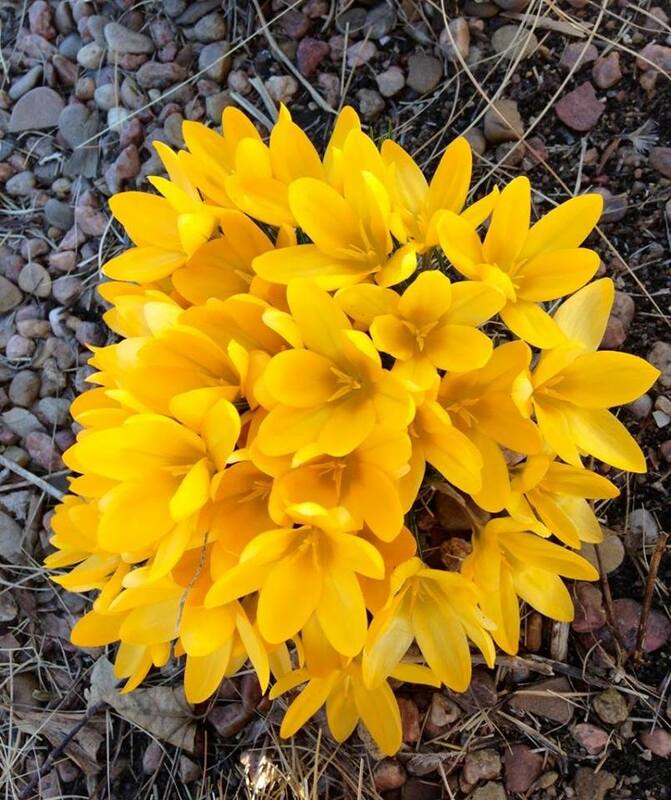 Yellow crocus, blooming in early March. DON’T miss out on great deals! Many bulb suppliers give big discounts for orders placed in spring and summer because their busiest season is fall. Think ahead and get your next tulip bed planned out and ordered before the big rush. John Scheepers has a great selection, and Ruigrok would be best for large orders of many hundred bulbs at a time. After all, you can never have too much spring color! An interesting thing happened in the Fall of 2012, after one of the hottest and driest summers on record – the prairie bloomed. The historic drought was harsh and many plants that were borderline hardy in Kansas were lost, but very few of the wildflowers and grasses of the prairie were lost. Asters, blue sage and goldenrods bloomed in spite of the brutal summer conditions. The native grasses, though much shorter, survived. 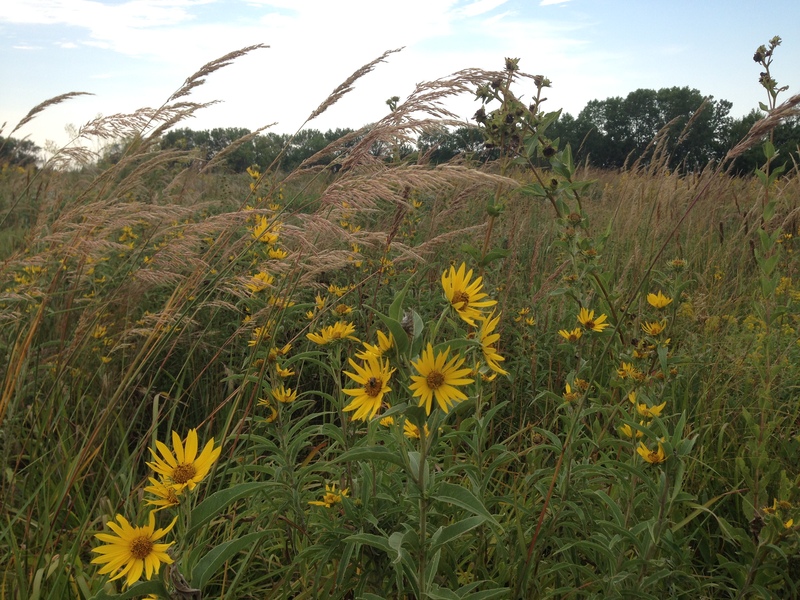 This was a great lesson about one of the ultimate surviving landscapes—the prairie. Kansas has some of the largest expanses of the tallgrass prairie in the United States. Less than four percent of the original North American prairie land is left. This sea of grasses and wildflowers survives floods and drought, high and low temperatures, grazing, fire and many invasive species. The deep roots and adaptability make it one of the most resilient landscapes in the world. 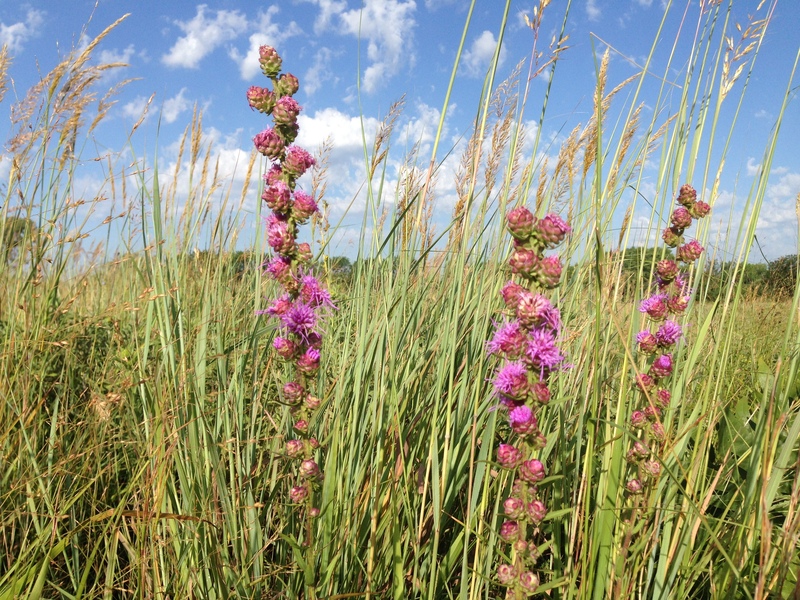 This prairie ecosystem manages heat and drought through adaptation. The deep roots absorb water that other shallow-rooted plants can’t touch. Plants go dormant during drought to conserve water and maintain growing points just at or below the soil surface. Once conditions improve, these plants begin to grow again. Leaves are shiny or have tiny hairs to reduce water loss. Grasses stay shorter and produce fewer seeds. Each of these adaptations help the prairie plants survive and use less water. This diverse ecosystem is resilient – more resilient than many other landscapes and certainly more resilient than a typical lawn. 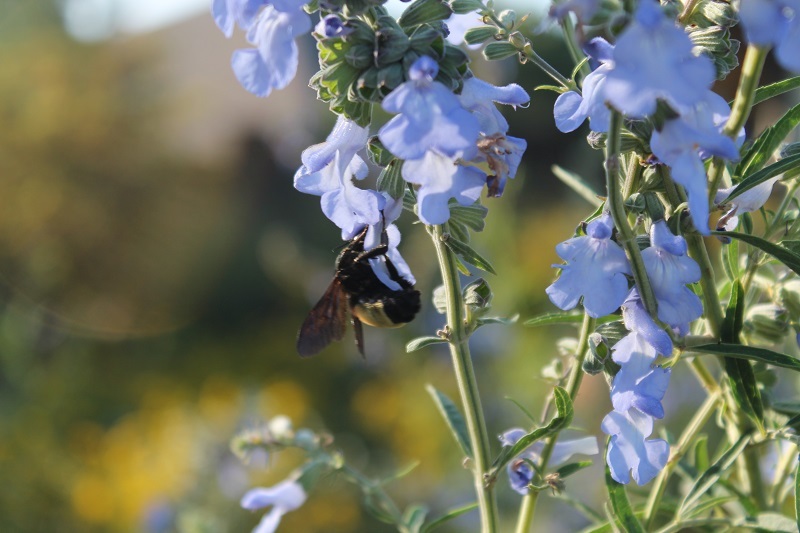 It provides habitat for wildlife and food and nectar for pollinators. It is a self-sustaining environment that persists through harsh conditions. Those drought years gave us a chance to evaluate what we are doing with our own landscapes and to take a look at the types of plants that will actually grow here with minimal time, water and maintenance. It provided an opportunity to select new plants that can tolerate adverse weather conditions. More and more Kansans are choosing plants like little bluestem, switchgrass or prairie dropseed. 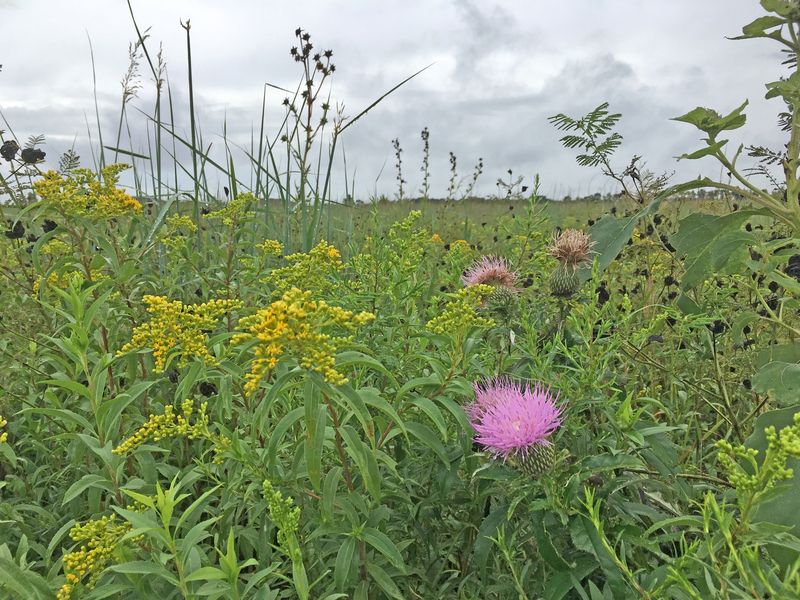 Gardeners are filling up their landscapes with wildflowers such as coneflowers, penstemon, blazing stars, goldenrods, asters and milkweeds in smaller “pocket” prairies. These micro-prairies have all the ornamental qualities of a larger prairie, but on a much smaller scale. Nature is a good teacher. These plants, which survived and even bloomed after one of the driest summers in recent memory, are amazing. I knew that prairie plants were tough, but that season made me take notice. It made me rethink my own perceptions of what is environmentally-sound landscaping. We can create sustainable plant communities in our own small landscapes simply by copying what nature has done so successfully in creating the prairie. These are beautiful plants that are diverse in form, texture and color. Plants that would work well in any sunny location. The combinations are endless. The prairie has a legacy of resilient beauty. Embrace what is around you and create a sense of place in your own pocket of the historic prairie land. 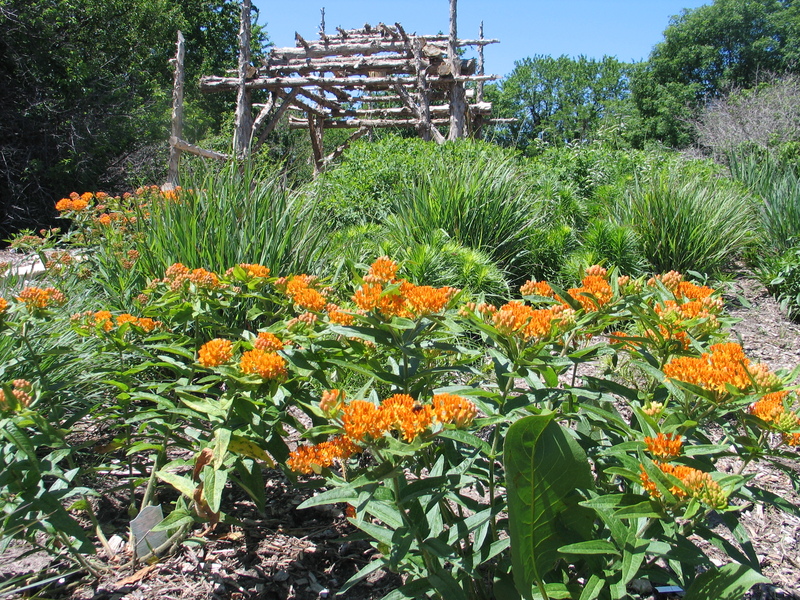 Garden centers and nurseries carry more native plants each year, because gardeners have caught on to the many benefits that native perennials – such as milkweeds, coneflowers, blazing stars, black-eyed susans, and penstemon – provide aesthetically and environmentally. 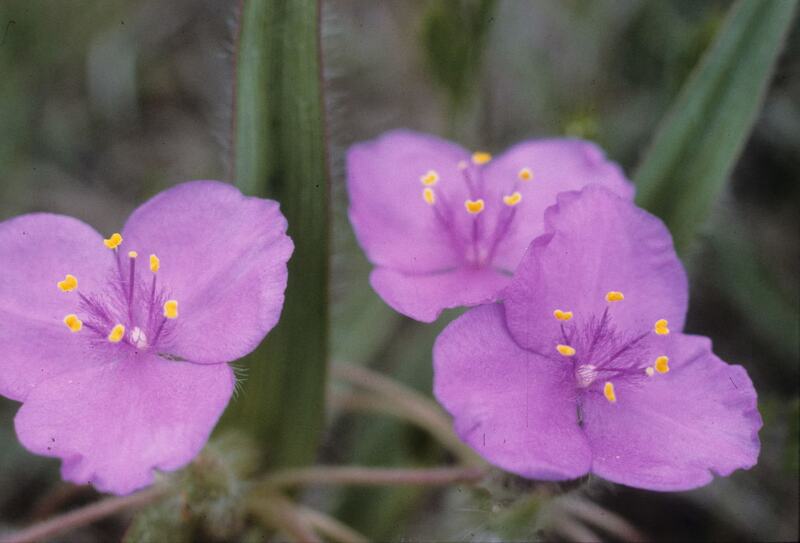 One of the best native plants for early spring bloom is spiderwort. They are fantastic in the gardens right now. 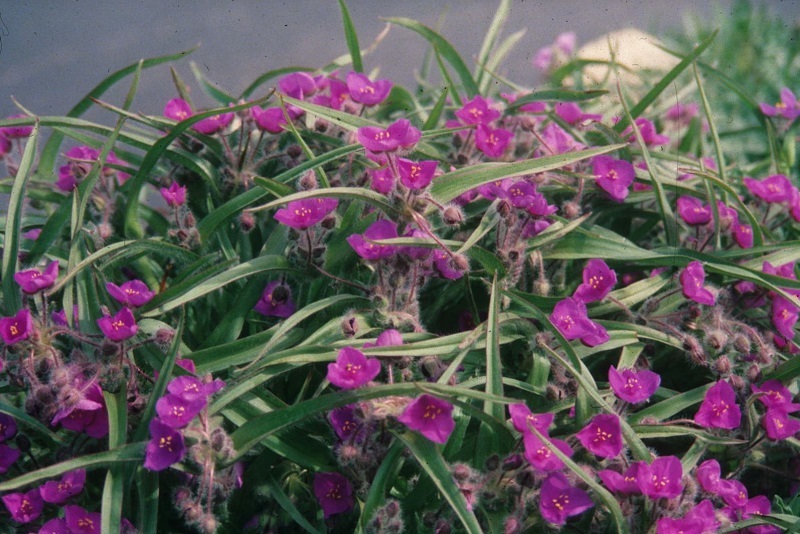 Native spiderworts are excellent alternatives for naturalized or xeric plantings. Ohio spiderwort (Tradescantia ohiensis) is the most common, prevalent in much of the Great Plains and eastern United State. It reaches three feet and has striking blue, rose or white flowers. Its cousin, shortstem spiderwort (Tradescantia tharpii) is not as common, but has more ornamental characteristics and growth habit. It exhibits excellent drought tolerance with minimal maintenance requirements. Shortstem spiderwort’s low growth habit and diverse flower colors make it a welcome addition to the front of any rock garden or perennial border. It is a prolific bloomer, covering itself with large three-petaled flowers in April and May. At least three distinct flower colors exist in our plantings, purple, blue and rose. I use this plant along the front of our perennial beds with summer and fall blooming perennials, because it does go dormant during the summer as a natural defense against the heat. I remove the brown leaves in the early summer and it greens back in late August as a rosette of hairy, pointed leaves. 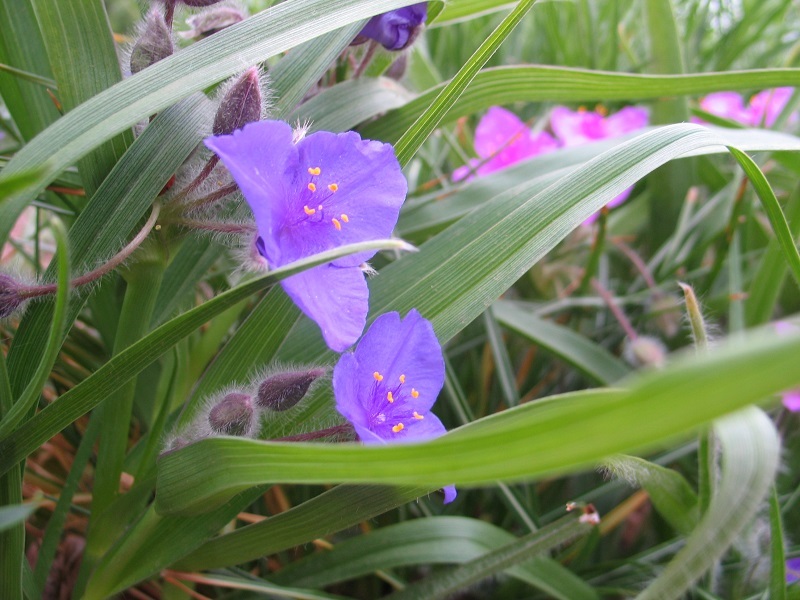 With proper planning, shortstem spiderwort gives the landscape an exotic—yet native and hardy—spring component. Honeybees and bumblebees flock to the flowers. The diversity of pollinating insects that this plant attracts is a joy to watch. Tradescantia tharpii reaches a mature height of 12 to 15 inches and 15 to 18 inches wide in full sun. 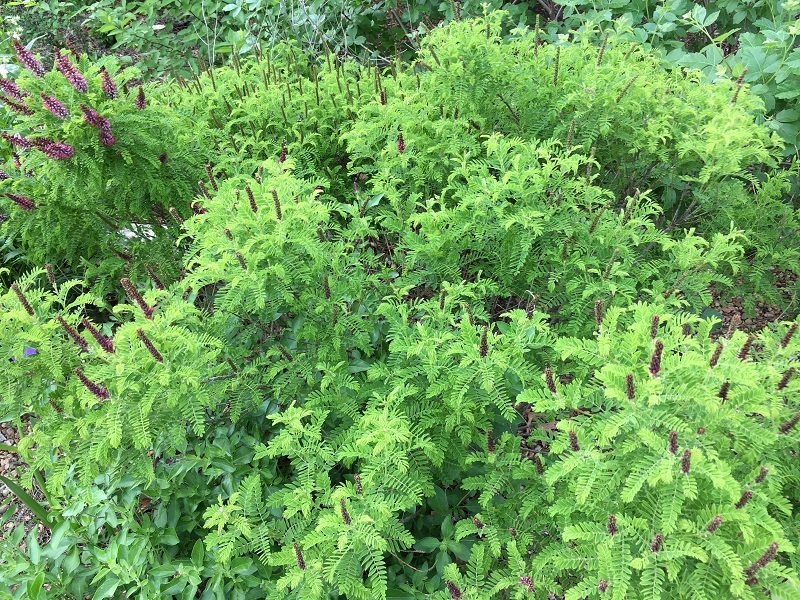 This species is multi-stemmed, forming a dense mound of green foliage. Leaves are linear-lanceolate, pubescent, giving a whitish cast, and have red translucent margins. The seed heads all seem to dry at the same time so seed collection is made easy, unlike Ohio spiderwort where the seeds ripen over an extended period. Seeds are oblong, gray and compressed about one eighth of an inch long. It prefers a well-drained soil, but it can adapt to moister locations as long as there is ample drainage. I have grown it for years in a gravel-amended sandy loam soil with no problems; plants in heavy clay or sites with poor drainage resulted in slow plant growth. This is one plant that thrives on neglect, as long as it is properly sited. Established plants are long lived. Plants in the Arboretum have been growing in established beds for up to ten years. I have not observed any disease or insect problems. In the fall and winter, however, rabbits will eat the rosette of leaves, stunting the spring growth. You can find this plant at our spring and fall sales or produce it through seed propagation. A warm, dry treatment before sowing the seed in a mixture of coarse perlite and potting soil gives the best germination. Germination should occur in about 7 to 15 days. Divisions of existing plants can be taken every two to four years depending on lateral growth. 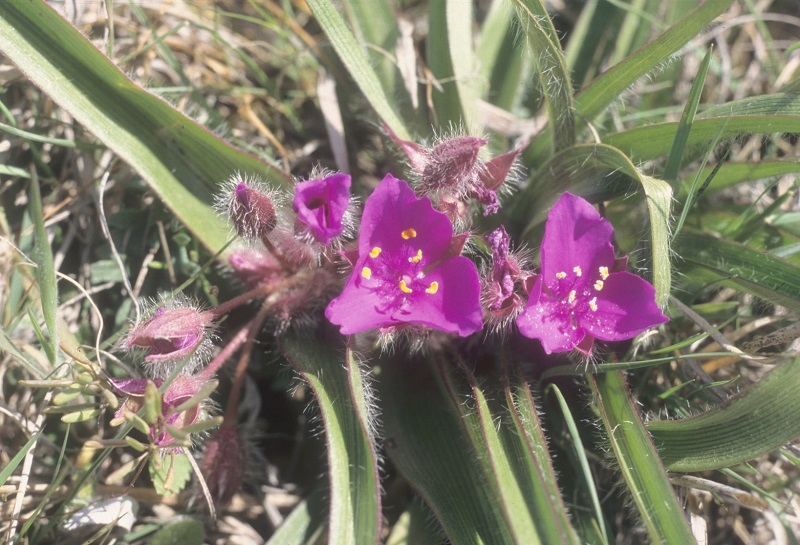 For the native plant enthusiast who wants to view this plant in a natural setting, Tradescantia tharpii can be seen growing on clay, sand or rocky soils in prairies and open woods. Native from central Kansas to southwest Missouri and south into northern Texas, it is essentially restricted to the Great Plains. 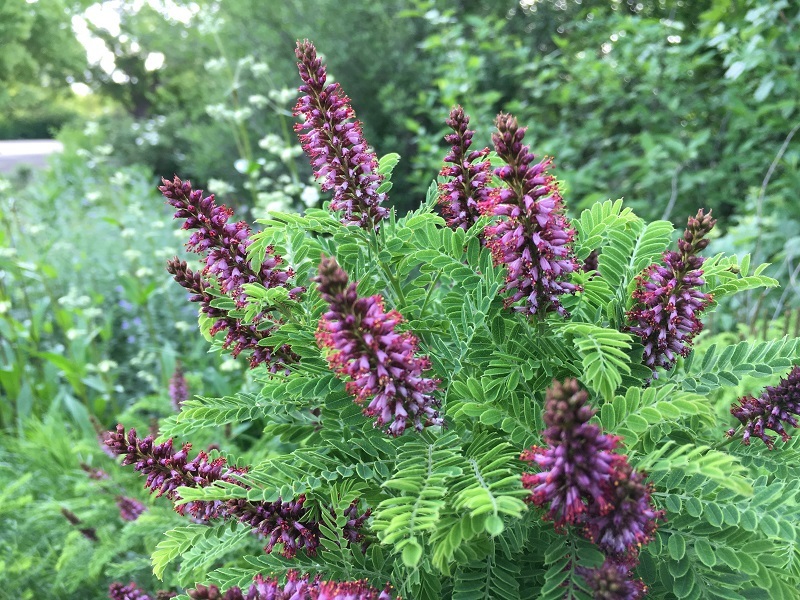 When we think of shrubs that grow in the prairie, lead plant (Amorpha canescens) is the first one that comes to my mind. Rightfully so, the soft gray foliage and lavender flower spikes are a must for any summer prairie garden. 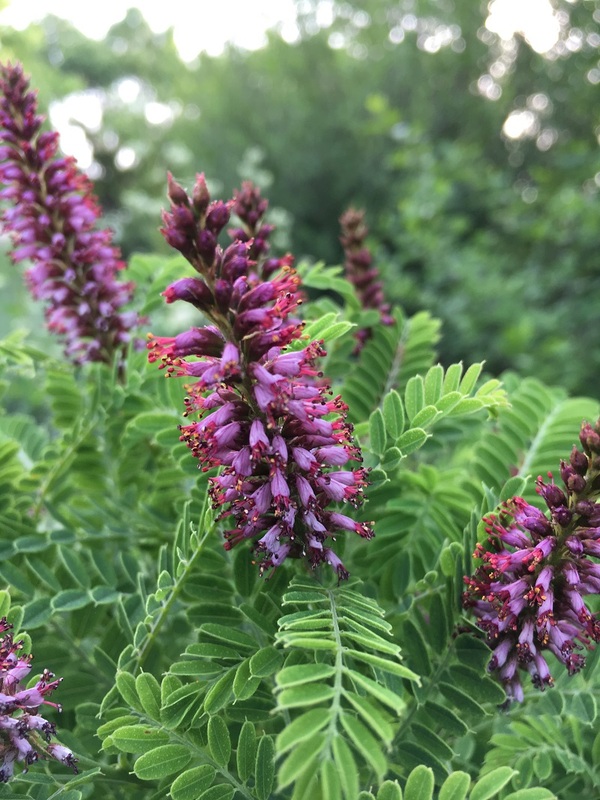 However, its lesser known cousin, dwarf false indigo (Amorpha nana) is blooming now in the Arboretum. It makes you stop and take notice. Dwarf false indigo can be found growing in the mixed-grass and shortgrass prairies throughout the Great Plains. In Kansas, I have seen it growing wild in Clark county. It is not as widely distributed as lead plant, but I have found it to be quite adaptable. It thrives in dry, open locations with plenty of sunlight. Here in the Arboretum, it blooms in May but I have seen it bloom as late as mid-June. The deep magenta flowers of dwarf false indigo have a sweet aroma like honey. Each terminal flower cluster is covered in reddish-orange pollen that pollinators love to gather. The flowers stand out against the bright green leaves. This prairie shrub should not be pruned in the spring. It blooms best from previous year’s growth. A variety of pollinators flock to the fragrant blossoms, but the Silver Spotted Skipper butterfly use the soft leaves as a food source. After the blooms, the small green seedpods develop, but turn dark brown later in the fall. The name nana, meaning dwarf in Latin, refers to the shrub’s diminutive size, which ultimately reaches two feet tall. While short, the deep tap root and finely textured leaves make it extremely drought tolerant. Plant it en masse or along a border edge so you can enjoy the sweet fragrance of the flowers. It prefers a well-drained soil, including clay and rocks. Companion plants for this versatile shrub would be little bluestem (Schizachyrium scoparium), evening primrose (Oenothera macrocarpa), bottlebrush blazing star (Liatris mucornata), aromatic aster (Aster oblongifolius), shortstem spiderwort (tradescantia tharpii), narrowleaf coneflower (Echinacea angustifolia) and butterfly weed (Asclepias tuberosa). 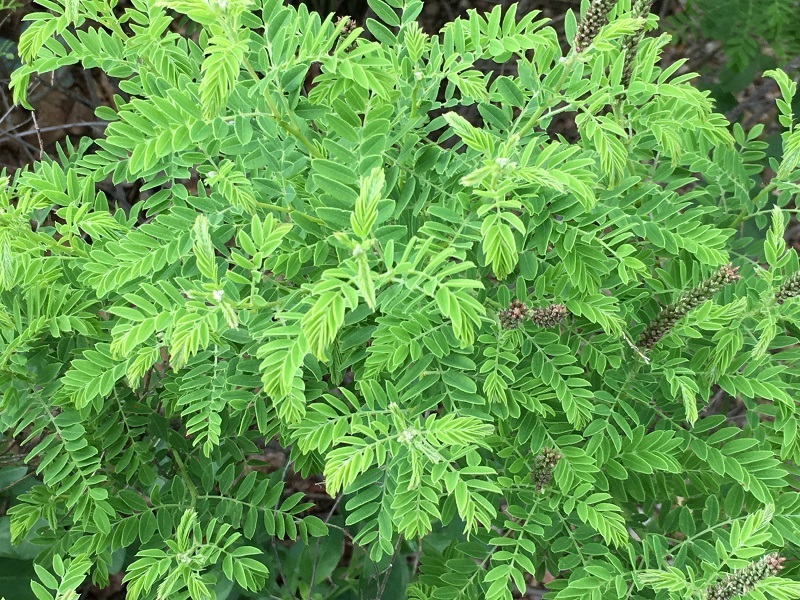 This shrub deserves a place in your sunny prairie garden. Join Us on Friday, May 12. 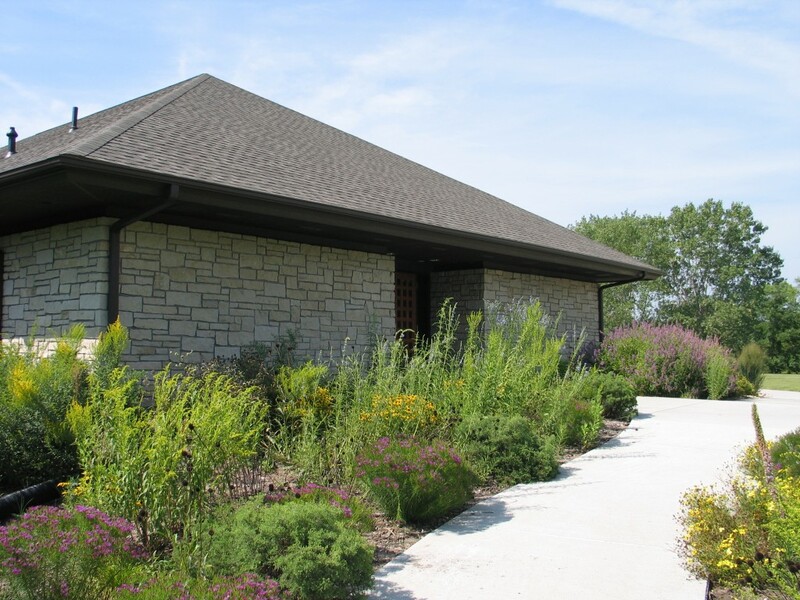 Dyck Arboretum of the Plains is offering a free wildflower to the first 25 families or individuals who obtain a new or renewed membership on Friday, May 12, for National Public Gardens Day! We will also have FREE ADMISSION to the gardens for the day, and coffee and refreshments in the Visitor Center from 9-11 a.m. THANK YOU TO EVERYONE WHO SUPPORTS THE DYCK ARBORETUM OF THE PLAINS! 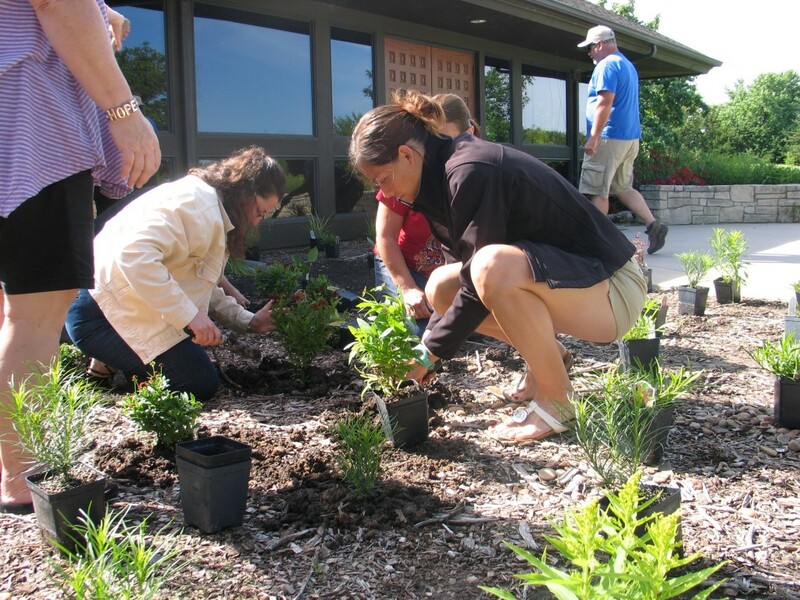 Originally published on April 29, 2015, here are some helpful hints from our Executive Director Scott Vogt on getting your native plants established using “waterwise” methods. Also, due to the rainy weather during our FloraKansas Native Plant Sale last weekend, we are happy to announce we will be having a “rain check” native plant blitz this coming Saturday, May 6, from 9 a.m. to 2 p.m. If you missed the weekend sale, come enjoy the lovely weather and consult with Scott and our other native plant experts in the greenhouse.